Piano removals can be difficult but with the right equipment and team it is made possible. We have moved countless upright pianos some even upstairs! 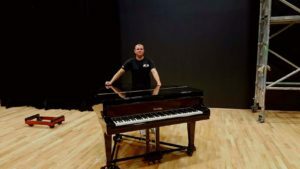 We’ve accomplished many baby grand piano removals some with high gloss finishes no problem safely wrapping dismantling and rebuilding. We use a piano trolley to manoeuvre them and make sure the flooring is protected if need be. 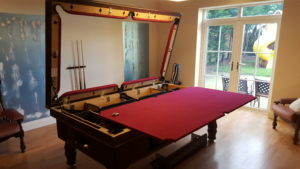 Pool table removals are done by dismantling them and ensuring the slate bed is heavily protected. Each part is marked or numbered if need be to ensure it goes back together the same way. Its also important to make sure each part is secured in the van. 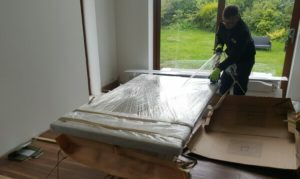 Marble table removals are done by wrapping the table top when it is in place with foam and card board covering each corner especially double protecting one end. It is then carried to the van with this end facing down and positioned in the van and secured. The base is also protected and positioned safely in the van. We use a tape measure to place the table top exactly where it should be in the middle when positioning at the next property. Glass tables are treated similarly. When we move American fridges we remove the doors as this makes it easier to carry and to fit through doorways. It reduces the risk of damaging the appliance and only takes a small amount of time to do. We refit the doors on delivery but always remember to let your fridge stand for at least 6 hours after moving it before it is switched on. Hot tub removals are becoming increasingly popular and can be quite a task. We’ve done plenty of them now and know the best ways to carry them out. We protect the sides and remove any loose parts also making sure the plug is kept out of the way of the mould or covered and taped off. Boards may need to be used to make smooth surfaces or ramps so the hot tub can be wheeled on a trolley. 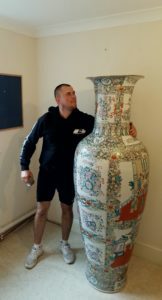 We have moved some highly fragile pieces but the ones that we are most proud of are the successful move of two hand painted vases from Japan over 6ft tall and very valuable. Large garden planters like the two we delivered to a well known England footballers property and other garden pieces also valuable items. We have also safely moved industrial machinery and equipment.